So, I took a chance. 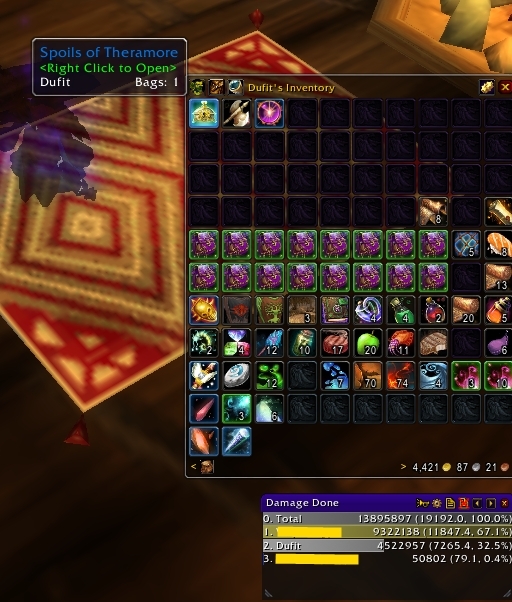 Dufit does pvp, not a dungeon runner. He que’d for the Theramore Fall scenario when it first opened up. Eight minute wait for group, no real clue what he was supposed to do. Suffice it to say, things could have gone better for him. Although Duf managed not to die during the run, he did run low on mana often. He had trouble keeping up with the rogue leader. “fast”, falls short of description here. Dufit’s two team mates where from another server, and obviously had que’d together. Should’nt have mattered, but it did. There was no talk. No “cover me”, no “do this or that”, no nothing. No mistake here, and no QQ. Dufit was ill-prepared. Chasing after and trying to keep up, he managed to fall off the docks not once, but three times. Can he spell “noob?” lol. There was one minor exception to the no talk stuff. At one point someone said stand in the gray circles and you’ll be invisible. Dufit followed the healer in what appeared to be a gray, large, circle. The healer ran dead into 6 Theramore Marines, and the fight for survival was on. Fortunately, we survived. Um? Dufit’s box was empty. 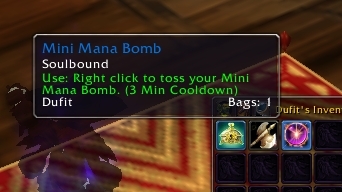 Alliance gets a pet, Horde gets a bomb toy. I gather the scenario is suppossed to take about 15 minutes to run. Dufit’s group took about 30 minutes. So, I guess the run time is pretty much group dependant. I will offer up one piece of advice here though. Pre-group with people you know. Oh, and take a minute to read about the event first. LOL! Don’t be a Dufit.